Reporter Molly Hacker prefers to write obituaries rather than report on the overwhelming minutiae of high society weddings. It’s only a temporary project she takes on in conjunction with her usual reporting assignments, but it facilitates the beginning of relationships that could have a permanent effect on her love life and future. Could it finally mean wedding bells? Will she have to set aside her “pickiness” in order to take the trip down the aisle? Does one have to ﻿﻿sacrifice their standards at the very altar at which they’re married? Beneath the refreshing humor and amusing situations that take place in this romantic comedy is a story of the human heart, the connection it desires, and the fear of taking that first step to achieve it, a fear of possibly having to resort to self-sacrifice in the process. This is perhaps most brilliantly illustrated during a poignant discussion between Molly and her good friend Randy toward the beginning of the novel. I thoroughly enjoyed the banter between the colorful characters as well as the ease in which the author injected wit and humor into the story. The plot twists were quite clever and I enjoyed the creative way the novel’s conclusion was handled. The main characters are smart, sassy and endearingly human with all the quirks and flaws that come with being human. Molly winds up in scenarios that had me thinking, Well, this could get messy, and in some instances my premonition was proven correct in both humorous and humiliating ways for the protagonist. Molly Hacker Is Too Picky! is an intriguing read that comes at a time when marriage, for some people, is more of a finish line in a race to boast about their status rather than a sacred ceremony to declare one’s loyalty to the person they truly love. 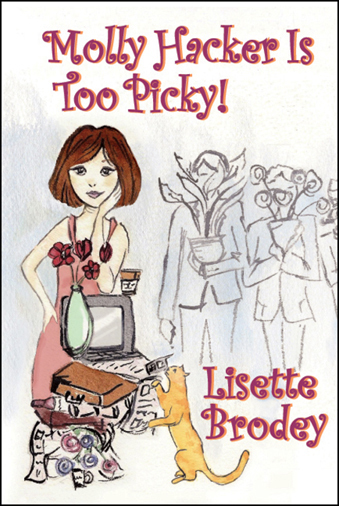 Lisette Brodey has done a remarkable job at executing an intricate plot while folding in the complex elements that often accompanies matters of the human heart and the pursuit of a compatible mate. For some, it is an endeavor that means having to explore different kinds of relationships to discover with whom they truly envision themselves for the long haul. You can also follow Lisette on Twitter and Facebook. This entry was posted in Blog, Reviews, Uncategorized, Writing & Publishing and tagged Amazon, Barnes & Noble, Book Review, Heart, high society, humor, Lisette Brodey, Love, marriage, Molly Hacker, picky, romantic comedy. Bookmark the permalink. I thoroughly enjoyed this book. It’s at once humorous and insightful! Hey, Christa! Thanks for reading and commenting. I totally agree with you, Lisette did an outstanding job in balancing the wonderful humor in a way that complemented the story’s powerful subtext. I cannot thank you enough for this eloquent review. I’m truly humbled that you not only got to know Molly, but you understand her so very well. Throughout my life, I’ve always been surprised to see people who find the state of BEING married to be more important than the union itself. Molly was more than happy to help me prove that’s not really the best way to go. My deepest gratitude for this beautifully written review. My pleasure, Lisette. I meant every word. Your work is truly remarkable. I look forward to reading your other novels, Crooked Moon and Squalor, New Mexico. Shykia writes a very good and personal take on Molly Hacker. She expresses some of her own feelings about the characters and the plot, which I interesting and a bit amusing. Shykia also reveals some of the dynamics at the core of the book. Well done, Shykia. Great interview. I loved Molly! Fantastic book! I absolutely loved your review highlighting the quirks and idiosyncrasies of simply being human. Lisette, does a marvellous job of taking the reader inside the mind of Molly Hacker, and experience her search for, Mr. Right.